Lysistrata is a co-production featuring two chamber operas that illuminates comedy and drama under the subtext of war. 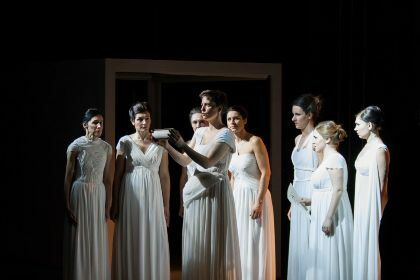 Inspired from the pacifist play ‘Lysistrata’ by Aristophanes, it uses contemporary classical, traditional and jazz compositions to accompany dramatic and witty librettos. This Project Pitch gives an insight into the radical contrasts – historical and cultural – of two countries and performers who together explore resonating themes of war, ambition and dominant masculinity alongside issues of peace, femininity and equity.